Nicole Enabosi is expected to return for a fifth season next fall. From football to track and field and everything in between, here are 19 Delaware athletes to pay special attention to throughout 2019. An offseason knee injury will keep Enabosi sidelined for all of the 2018-2019 season, but the reigning CAA Player of the Year is expected to return for a fifth year. Enabosi averaged 18 points and 11.8 rebounds per game a season ago. Delaware has struggled mightily without Enabosi, starting 0-3 in conference play for the first time since Enabosi’s freshman year. But the Blue Hens will only graduate forward Makeda Nicholas and guard Alison Lewis from this year’s team, when they welcome back Enabosi in the fall. If Delaware continues on its current trajectory (the Blue Hens have averaged league-worst 43.7 points per game on 24.4 percent shooting in CAA play), it would make sense for young players to receive more playing time. Dickey, a freshman, should continue seeing the court despite her struggles in recent weeks. In 29.1 minutes per game, Dickey has averaged 8.0 points and 9.4 rebounds (second-best in the CAA). She has earned four CAA Rookie of the Week awards. But like the rest of the Blue Hens squad, she’s gone cold offensively. It will be interesting to see if Dickey, who’s often assigned to the top of Delaware’s zone defense, can develop into a cornerstone player or if she’ll remain a role player. Adderley’s draft stock rose throughout his All-American season and could continue to improve if he shows well in front of scouts at this month’s Senior Bowl and February’s NFL Scouting Combine. The subject of much scrutiny in the fall, Kehoe provided much-needed stability to Delaware’s quarterback room in 2018. After finishing last in the CAA in passing the past two seasons, Delaware rose to eighth, averaging 195.1 passing yards per game en route to its first playoff appearance since 2010. But as the team unfurled in its final four games of the season, a stint in which Delaware went 1-3 and was outscored 95-51, so did Kehoe. The redshirt junior quarterback averaged 4.2 yards per attempt in the final third of the season, while playing through a partially torn ACL. Kehoe did not need to undergo offseason surgery for the ACL injury, according to Head Coach Danny Rocco, and the concussion symptoms that held him out for much of the Villanova game dissipated enough that Kehoe practiced the following Wednesday and played every snap against James Madison. Delaware would be well-positioned to enter 2019 with Kehoe behind center, but the Blue Hens have other options they can explore, too. Smyrna graduate Nolan Henderson and Broomall, Penn. native Anthony Paoletti could both vie for the starting job. As the Blue Hens modify their offense under first-year coordinator Jared Ambrose, will Kehoe be the at the center of those plans? Redshirt freshman Nolan Henderson delivers a passs against Villanova in Delaware’s 2018 regular season finale. In his only extended playing time as a redshirt freshman, Henderson completed 12 of 20 attempts for 152 yards in Delaware’s regular season finale against Villanova. He connected with Joe Walker for a 43-yard touchdown and had runs of 18 and 16 yards. Henderson’s upside comes in the form of his elite athleticism. Henderson’s running ability allows an offense to explore every inch of the playbook. If he doesn’t supplant Kehoe as the starter, could Henderson carve out a role as a gadget player? When he joins the Blue Hens lineup next fall, Darling, a transfer from the University of Alabama at Birmingham (UAB), will complement returners Ithiel Horton, Ryan Allen and Kevin Anderson as a sharpshooter from beyond the arc. In 33 starts as a sophomore at UAB, Darling shot 40.9 percent on 3-pointers and averaged 10.1 points per game. After transfering, Darling has to sit out the 2018-2019 season. Next year’s season opener won’t be the first time Darling shares the floor with Allen. The two attended Dematha Catholic High School in Hyattsville, Md. with Philadelphia 76ers No. 1 pick Markelle Fultz. Carter leads Delaware with 17.3 points per game, 10.3 rebounds per game and a 60.0 field goal percentage. He ranks fifth, second and third in the CAA in those categories respectively. After a handful of scoring outbursts in non-conference play, including a 29-point night in the season opener at Maryland and a 33-point performance at home against Saint Francis, Carter’s offense has dipped slightly at the start of CAA play. In conference play, Carter has averaged 12.3 points (third on Delaware) on 47.2 percent shooting. But all it takes to keep dancing late in March is a hot weekend in Charleston. Carter has often looked like one of, if not the best, big men in the CAA. 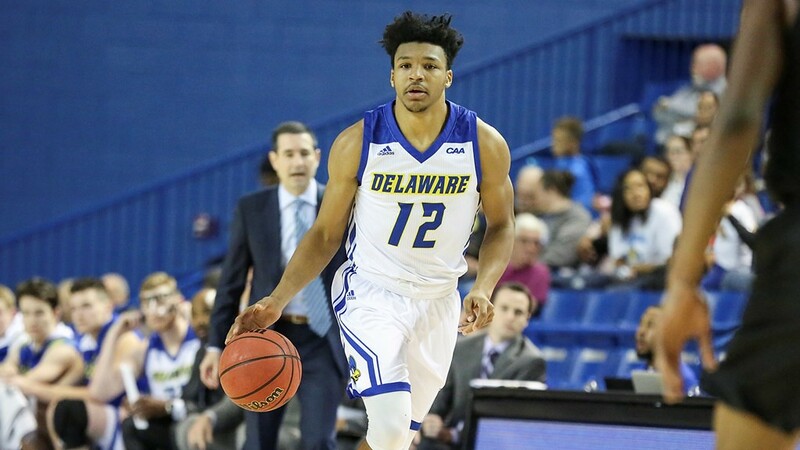 Freshman Ithiel Horton is on pace to become the third straight Delaware player to be named CAA Rookie of the Year. The recipient of three CAA Rookie of the Week awards, Horton is well on his way to becoming the third straight Blue Hen to win CAA Rookie of the Year. Horton has been a more efficient scorer than Daly in 2016-2017 and Allen in 2017-2018. He already has four games with 20 or more points. His 31 points at UNCW on Jan. 10 tied a Delaware freshman record. A graduate of St. Mark’s High School, Sullivan IV turned down the Philadelphia Phillies, who selected him in the 28th round of the 2017 MLB Draft, to join the Blue Hens. In 14 starts as a freshman, Sullivan IV posted a 2.97 ERA, 0.91 WHIP and 95 strikeouts, while hitters batted .199 against him. After his sophomore season, Sullivan IV will be eligible to enter the MLB Draft again. 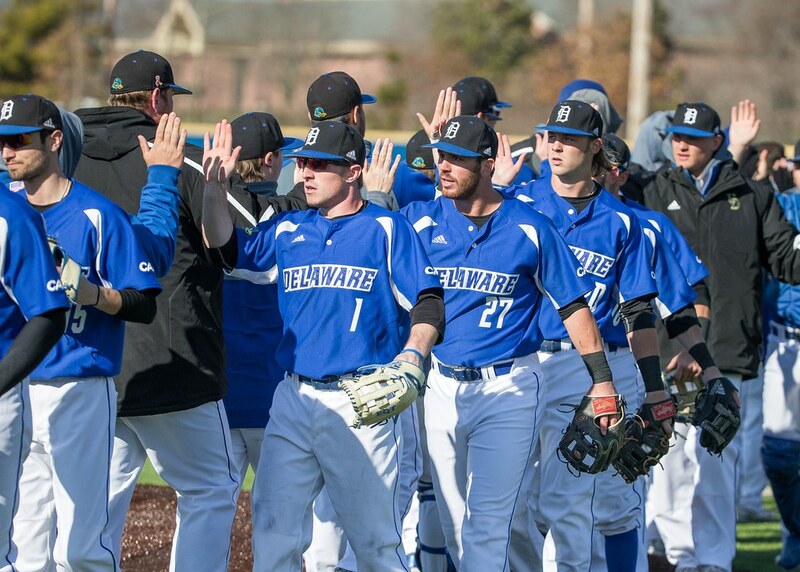 The Blue Hens center fielder will finish his career this spring, having started 167 of the 168 games he’s played in across his first three seasons. Mohollen holds a career line of .296/.408/.426 (batting average/on-base percentage/slugging percentage). He’ll once again be relied on to set the table at the top of Delaware’s lineup. The CAA Player of the Year in 2018, de Koning will now carry more of the offensive load with national champion stars Greta Nauck and Lisa Giezeman having played their final games in a Delaware uniform. de Koning, a native of Vreeland, The Netherlands, tallied 51 points on 19 goals and 13 assists in her first two seasons at Delaware. Steinmetz returns after a first team All-CAA season in which she hit .341 and slugged a team-best 10 home runs and 12 doubles. Entering her senior season, Steinmetz ranks second in school history with 127 runs batted in. Behind Steinmetz and first-year head coach Jen Steele, Delaware will try to improve upon its 18-31, 8-13 record from a season ago. Delaware’s leading cross country runner, Diana Dunn will now take her talents to the track. Distance coach Ryan Waite said this fall that he expects her to compete in every event from the 800 meters to the 5000 meter…Ashley Bailey returns for her senior season as already the best pole vaulter in school history…Timo Hummrich is the leading returning goal scorer to a Delaware men’s soccer team that graduates five seniors…Women’s lacrosse midfielder Mia DeRuggiero is second in school history with 36 assists and still has two seasons to go. The junior finished second in the CAA with two assists per game last year…Tessa Verweijen, last year’s field hockey CAA Rookie of the Year, will be one of the many Blue Hens leaned on more in 2019 with five seniors set to depart…The only regular contributors to Delaware’s 2016 field hockey national championship on the 2019 roster will be Ally Pollak and Sarah Horgan. They both earned CAA All-Rookie team honors that year.